Enter to win Grinder Season One! 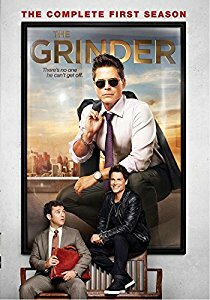 Mind on Movies is very excited to announce that we are working with the upcoming Blu-ray release, Grinder Season One, starring Rob Lowe. Starring Emmy® nominees Rob Lowe (The West Wing, Parks and Recreation) and Fred Savage (The Wonder Years), The Grinder is a comedy about two brothers: Dean (Lowe) is a spotlight grabbing actor who plays TV’s most popular lawyer, and Stewart (Savage) is a real-life, small-town attorney who has yet to find his spotlight. When Dean’s series is cancelled, he moves back to his hometown where it doesn’t take long before he’s inserting himself into every aspect of Stewart’s life, both in the courtroom and at home. But when the brothers stop arguing with each other, and start arguing together in court, they make a formidable team...sort of. Own Grinder Season One on Bluray and DVD Today! a Rafflecopter giveaway Disclaimer: Only one entry per mailing address per giveaway. The prize will be sent via FedEx or UPS. No P.O. Boxes please. This contest is from Mind on Movies working with Twentieth Century Fox Television. The entries will be checked. You must do what it says on the widget option to enter to win.